I lie awake some nights imagining new designs, new ways of putting these wonderful materials together so that they work, both functionally and aesthetically. The trigger for this kind of insomnia can be any number of things. One is a fresh batch of beams, logs, or barn siding in different sizes than I had in stock; another is a customer request for a specific need; but not infrequently it's some odd thing I have seen that fires me up – an object, or shape, or surface. Whatever it is, the process of developing a design can bring me a special kind of exhilaration . . . and sometimes frustration. I've learned not to force the design process. When stuck, I pay attention to the great American humorist, James Thurber, who title one of his books Leave Your Mind Alone, and to Winnie-the-Pooh, who said "A day of no bother is what is called for." Both Thurber and Pooh abandon overthinking in favor of a mysterious, magical, intuitive process that goes on out of consciousness. I believe in that strange process, not just for design and art but for most of life's most important issues. In 2007, architect and author David Lewis wrote a book on my work and made some hugely gratifying comments. "I am often asked whether Brandegee is unusual in the wide spectrum of art. Yes and no. He belongs, in one sense, to a long tradition of American folk artists and craftspeople, to the makers of New England weathervanes, the makers of Shaker tables and chairs, and the sewers of quilts; to the traditions of the builders of cabins and barns and to itinerant painters, tinsmiths and potters. That's one end of the scale. At the other end stand many of the greatest twentieth century artists, like the sculptor Constantin Brancusi, for whom the traditions of his own heritage, Romanian folk art, permeated the language of his work, his studio and his everyday life. To what richer traditions could any contemporary artist belong? In all of Brandegee's things – usable sculptures is the way I think of them – the strength of the tree and the wielder of the settler's adze are brought into our technological twenty-first century lives in a simple, powerful language, without distortion and without loss of scale. 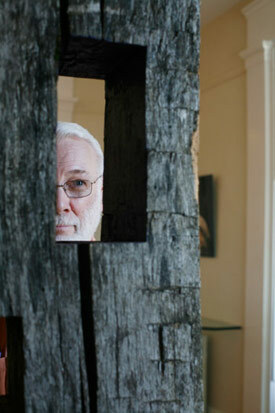 Brandegee steps back: he allows the old woods with all their history to speak for themselves." I hope to live up to such comparisons in every piece I produce. The log cabin materials came first. We had acquired an early 19th century cabin on farm acreage in the mountainous country south of Bedford, PA, and while restoring it, another of the same vintage less than 5 miles away, and purchased, dismantled, and re-erected it next to the first cabin. The process, including some cutting and shaping, and some crafting of replacements parts, worked its magic on me, filling my head with more and more ideas for furniture. After producing a few of my designs, friends commissioned several pieces and urged me to offer them more widely. I started scouring the countryside for dilapidated structures and their hand hewn materials, and in 1997 launched Logjam, Inc. I've been at it since. Today, a stock of beams, log cabin logs, and barn board is housed in a pole barn on our Bedford farm. Odds and ends of other wood are there, too, awaiting their reincarnation.